Mercury is a poisonous neurotoxin commonly found in everyday sources from drinking water to bleached flour and cosmetics. Behind lead, mercury is the second most common metal toxin and both can pose great physical and mental health problems. Learning problems, developmental delays and behavioral problems are linked to lead, mercury and other heavy metal exposure. A report by the National Academy of Sciences stated that toxic chemicals and other environmental factors cause about 3% of all developmental and neurological disorders. 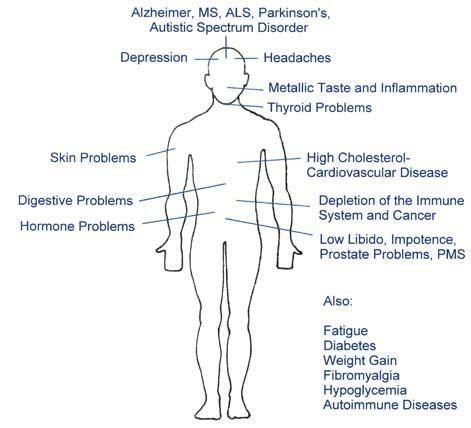 Mercury and heavy metal toxicity can cause or be mistaken for chronic conditions such as depression, fibromyalgia, autism, Attention Deficit Disorder, Chronic Fatigue Syndrome, Multiple Sclerosis, and a host of other serious disorders. Children are especially susceptible to heavy metal exposure. Even small amounts of lead, mercury and other heavy metals can pose a threat to a child’s developing brain. – Chronic muscle or soft tissue pain. If you have been diagnosed with a chronic physical or mental health condition, you should consider Oral Chelation Therapy which can remove mercury and other heavy metals through a detoxification process and greatly improve symptoms, or eliminate the symptoms altogether.